If you like the idea of a fall wedding you probably agree that white gowns are so last year. Who even wants a white gown anymore? It’s very old-fashioned and just passé. Fall weddings are a great opportunity to add a bit of color to your wedding, a chance to do something fun and colorful, and you know, add a bit of spice. 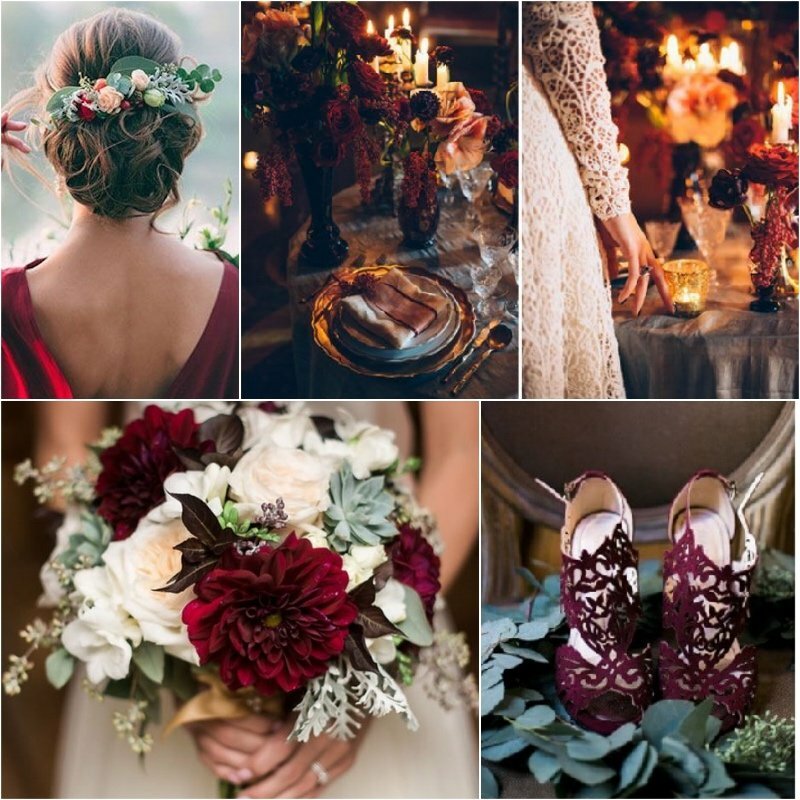 So here’s a look at some of the best fall wedding color schemes that you could incorporate into your special occasion. Nature turns all shades of red this time of the year and it would be a crime not to pay homage to that. We’re not saying you should have a red wedding dress, but you could easily incorporate red accessories into your look. A pair of red shoes would go great with some deep red lipstick and a dark red bouquet. You can also add matte golden or muted orange accents to the decorations to add to the theme of foliage. Not a lot of people would think to combine these two colors together, and even less would consider it as a wedding theme. 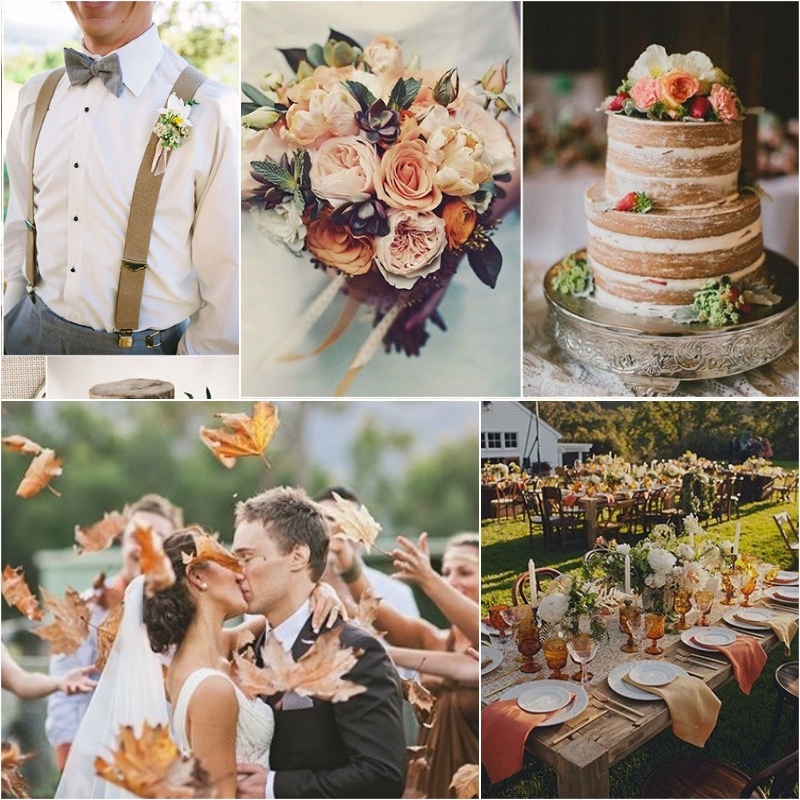 So by choosing emerald and blush as the main colors for your autumn wedding, you’re practically guaranteed to have a unique wedding, not to mention how gorgeous everything will look. It’s a great choice for those who want to have a wedding at the end of summer/beginning of autumn. If you can score a location in the Irish countryside and get a blush dress – you’re freaking golden. 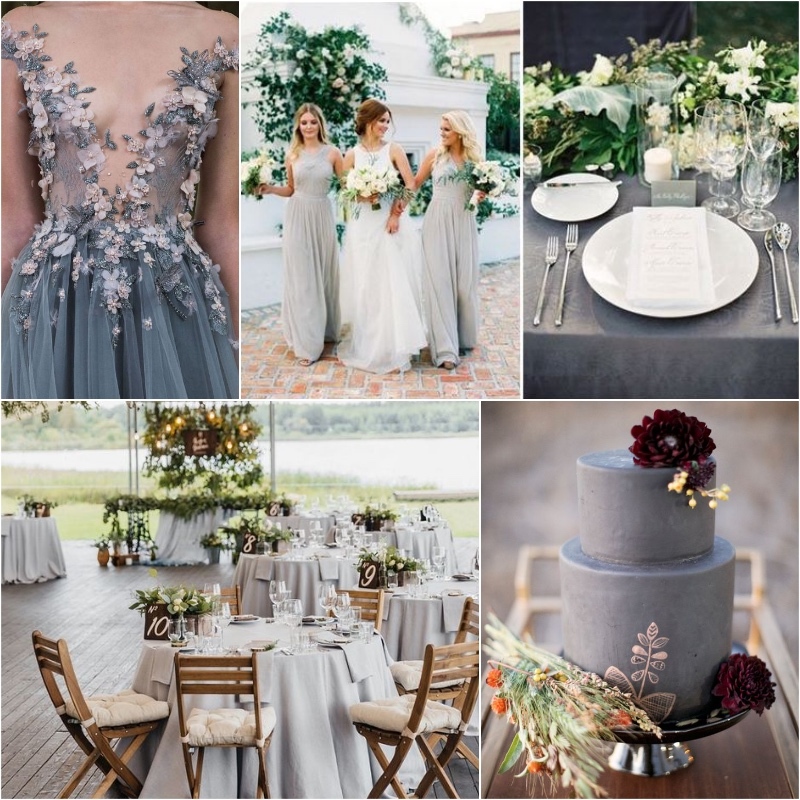 A great way to give a nod to a traditional white wedding while still being original and doing your own things is to go for shades of gray. Everyone knows gray looks awesome and classy as hell on everything. Be it a dress, your shoes, your furniture, decorations or literally anything. And since there are so many shades of gray and they all go well together you could easily have a cool monochrome wedding. Add touches of silver for a more festive look. And of course, you could go for a grayish white when it comes to the dress. If you roll your eyes when you hear pumpkin spice, wait for a second and give it a chance. First of all, no matter how basic pumpkin spice latte has become, some of us love the taste. But secondly, and more importantly, as a color scheme – this is absolutely gorgeous. And again, you can go for soft shades or more vibrant colors, but either way, this will look incredible as a wedding color scheme. And you know, if you’re brave enough you could even serve pumpkin spice latte as a drink. 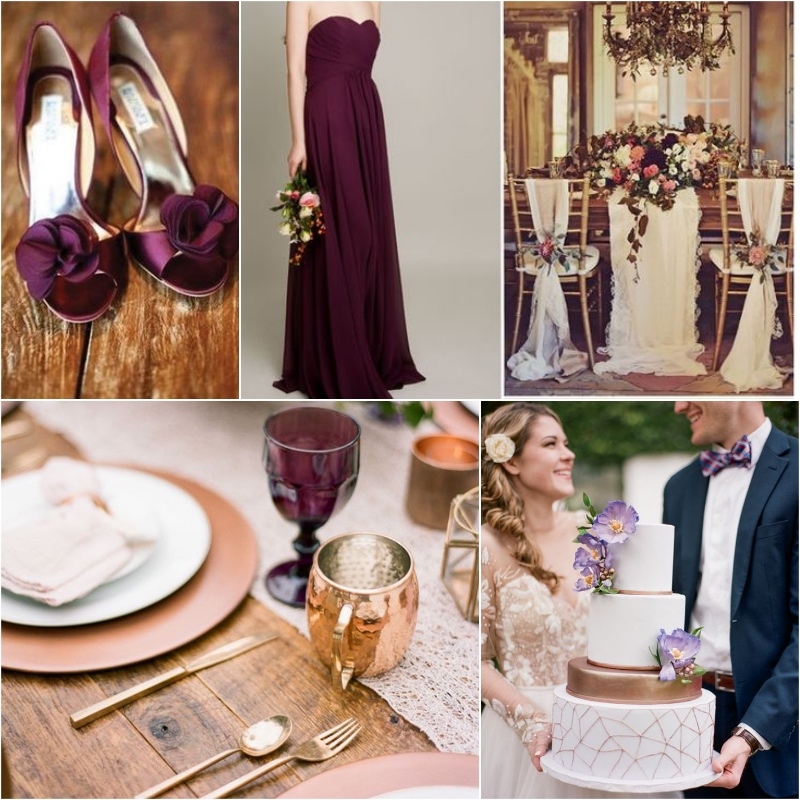 If you want a super glamorous wedding, copper and concorde are the shades for you. These are very rich colors that will definitely make your wedding an affair to remember. You could go all out with decorations, and make everything super glam, but even if you go for a rustic setting – adding touches of these colors will glam the whole ordeal up a lot. Some might say it’s a bit out there and looks a bit over the top, but hey, it’s a wedding, how much more over the top can you get? 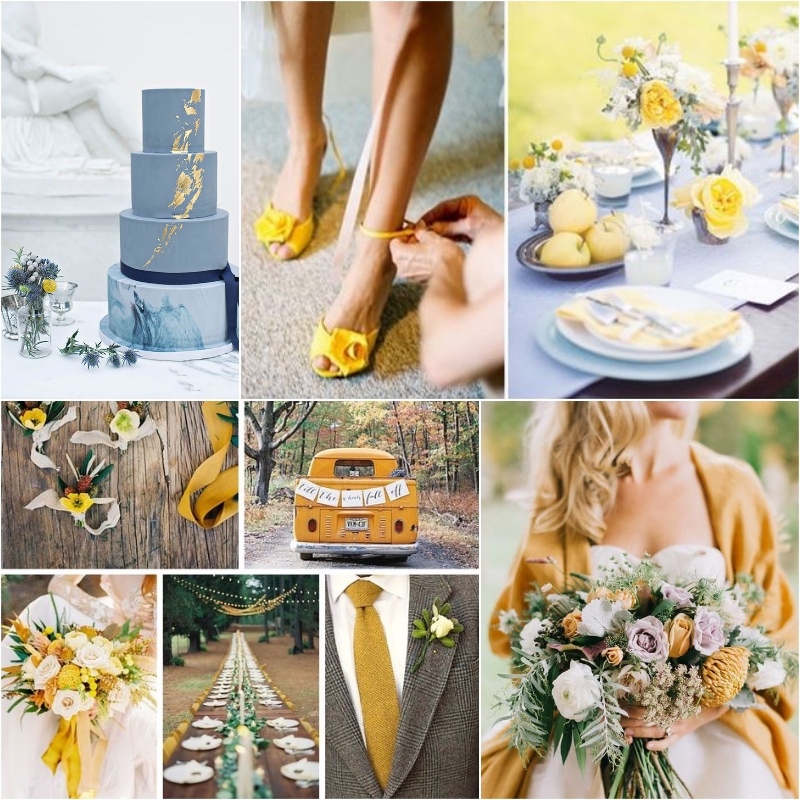 If you want to add a bit of warmth to your wedding color scheme mustard is the way to go. 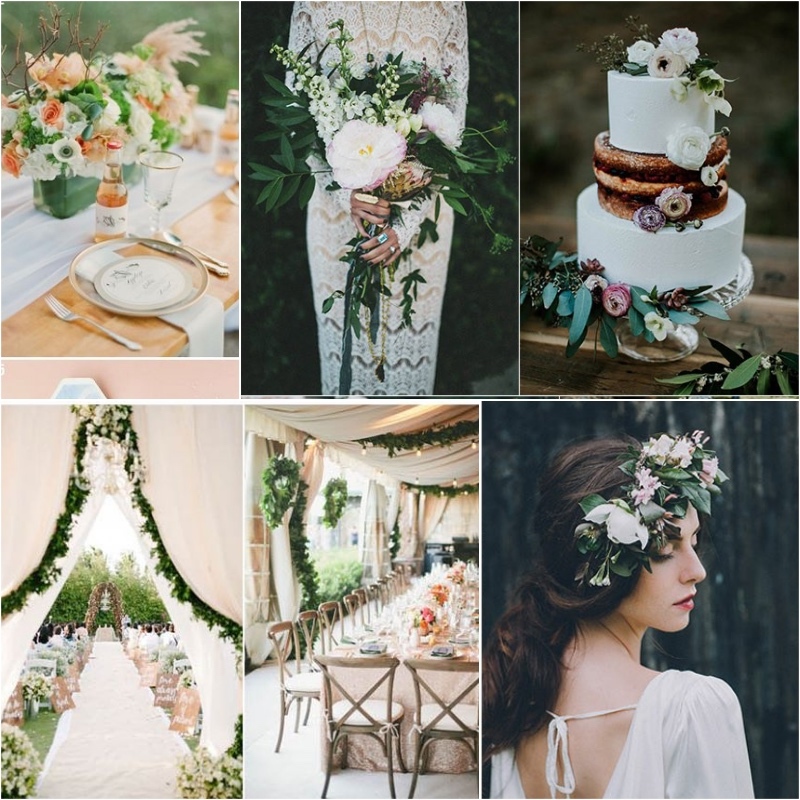 It’s a very autumnal color that will add a cozy vibe to your event, but it’s also very on trend this year, so it’ll give your wedding a very stylish and modern feel. You could also implement other shades of yellow, and pair them with sky blue. Altogether it’ll look gorgeous and give you an atmosphere of the last sunny days of summer and impending warm shades of autumn foliage.